I am currently a jazz and contemporary lyrical dancer. I dance regularly with Michelle Barber (jazz fusion) and will be performing with her at the upcoming Broadway Dance Center Student Showcase. I started my concert dance training with Heather Rigg (jazz) and Stacie Webster (contemporary jazz). 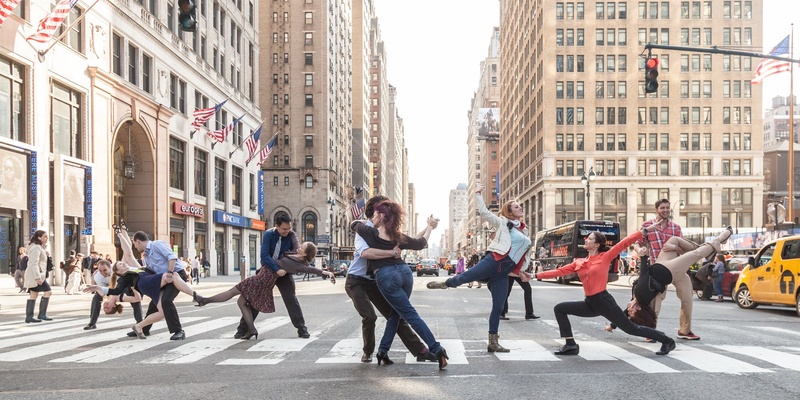 Outside of the studios, you may have also seen me in Improv Everywhere missions such as Crosswalk Ballroom dancing in front of Penn Station or Dance Captain Wanted interacting with the crowd at Bryant Park. Previously, I learnt vintage social dance from Richard Powers at Stanford University and was a member of the Academy of Danse Libre, Decadance, and Cardinal Whirlwinds. While I dabble in contemporary social dance forms such as swing and blues, my true heart belongs to the 19th-century waltzes, redowas, and mazurkas. I attend and sometimes perform at various dance festivals such as the Spoleto Festival dei 2 Mondi, Prague Vintage Dance Week, and Newport Vintage Dance Week.